Nearly all businesses involved in food services offer potatoes on their menus. With millions of restaurants operating throughout Ontario it can sometimes be tough to keep an edge on the competition. The Ontario Potato Board is dedicated to helping you provide the best product possible to your customers. Browse our tips on how to purchase the most appealing potatoes to serve in your business. Although using the best quality Ontario potatoes is essential to keeping your clients happy, we realize it is also important to do so at an effective cost. 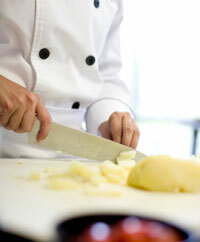 Take a look at our ideas for creating an “economic menu” using potatoes as focal points. Potatoes are a very versatile vegetable. If you are looking for a way to spice up your menu, take a look at how we spin regular mashed potatoes into tantalizing side dishes in our “Versatile Potatoes” Section. Potatoes are an essential part of the food services industry. Make sure you provide the best Ontario potatoes.